Alfresia Mosca 2 Seater Swing Seat - Green Frame with Luxury Cushions. Green 2 seater swing seat with matching canopy. Includes 2 luxury cushions, each with built-in valance and matching scatter cushion. Water-resistant canopy provides shade and cover from light showers. Cushions are 100% polyester with light water-resistant coating and thick foam inner. Dimensions: Frame - 145cm (W) x 100cm (D) x 160cm (H); Seat - 112cm (W) x 56cm (H). The Mosca 2 Seater Swing Seat is perfect for adding a little luxury to your garden or patio. The wide swing bench has plenty of room for two people, with a set of luxury swing seat cushions to provide comfort. The tubular steel frame is strong and sturdy, with the standard A-frame design giving it balance and stability. 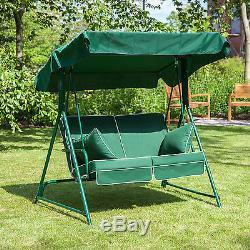 The deep green is perfect for fitting into the garden, with a matching canopy to the top. Made from water-resistant polyester, the canopy slides onto the front and back of the frame so is really secure and gives great cover from the sun or light showers. The swing bench itself is held steady by a hook on each side of the frame, which can be removed to allow free swinging movement. The bench features strong steel springs to the top to secure it to the frame while still allowing movement, and armrests to the sides for comfort. Supplied with two luxury swing seat cushions in a choice of bold colours, each with contrasting piping to the edges and ties to the back to secure them to the frame. The built-in valance on each seat cushion hangs down to cover the front of the frame, while the included scatter cushions provide comfort for the arms. The cushions are made from 100% polyester with a light water-resistant coating, so they're protected from spills and easy to clean. Each swing seat cushion is filled with 10cm thick foam for excellent comfort, while the scatter cushions are filled with blown fibre for a soft finish. Filled in the UK to a high standard. Please note, the frame is delivered flat packed for home assembly and will need two people to build it. This swing seat has a maximum combined user weight of 260kg. We are dedicated to ensuring the highest possible quality service to our customers. You do not need an existing account in order to use this service. What we get charged from our couirers we pass onto our customers. How can I chase my order? Do you offer a guarantee? All home-essential-uk products are guaranteed for 12 months to be free from defects in workmanship and materials in normal domestic use. This guarantee excludes damage from accident, alteration, misuse, abuse or normal weathering. If the product has a defect in any way we will pay the collection charge. If the product is fine but you change your mind for example there will be a collection charge. We cannot check messages on order notes regarding address changes. Leading homewares, laundry, cleaning, garden furniture, barbecues and outdoor living retailer. Top brands including Minky, Alfresia and Fire Mountain. The item "Mosca 2 Seater Garden Patio Swing Seat Green Frame with Luxury Cushions" is in sale since Friday, April 21, 2017. This item is in the category "Garden & Patio\Garden & Patio Furniture\Garden Chairs, Swings & Benches". The seller is "home-essential-uk" and is located in Rochdale. This item can be shipped to United Kingdom.